Top 10 Wedding Sherwani & Men’s Suit Designers Whose Signature Styles We Bet You Didn’t Notice! A wedding is not all about the bride. Though, it seems to be, for the most part. The bride is in the limelight, her garments chosen, her lipstick picked out, her shoes tried on. And all of this, at least 2 months before the date. But we assure you, the groom is just as important! Normally, the groom’s suit or wedding sherwani is none too fancy. The same silhouettes, the same embroidery, probably the same expected-to-use color palette as well. Well, it’s 2016 and this no longer needs to hold good. He deserves just as much attention as her. And this thought seems to have crossed the minds of our country’s top fashion designers as well! 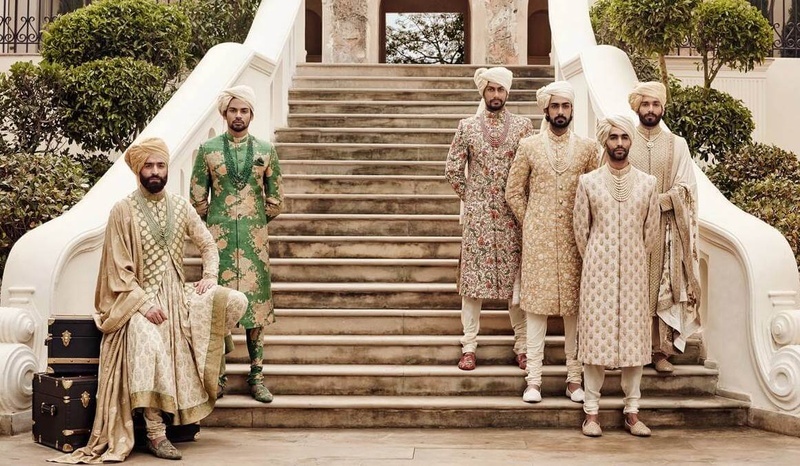 So here’s a look at India’s top 10 wedding sherwani and men’s suit designers along with their work of art to help plan a little better. Be it straight-cut men’s suits, heavy Indian wedding sherwanis or a gorgeous blend of both, Manish Malhotra can do it all. If you’re leaning toward the western side, adding embroidery to your groom’s suit can result in a whole new look. Tone-on-tone or contrast, they both look pretty great. Just make sure you pick the right colours. If you want something ethnic, raw-silk sherwanis with dhoti pants and a statement shawl works well. Known as the king of drapes, this Indian fashion designer’s collection usually has differently draped dhoti pants or patiala salwars. Pairing this with western-cut jackets in rich fabrics like velvet along with jutis creates a whole new look that grooms can carry off with utmost confidence. This designer duo is known for fusing Indian traditional aesthetics with a globalised look. Their collection uses looped hems with various weaves and an uncommon colour palette. Add embroidery at minimalist areas of your wedding sherwani or groom’s suit like the collar or cuffs and pull off their signature style with ease. Known to produce regal Jodhpurs, jackets and bandhgalas, this Inidan fashion designer’s work comprises of clean-cuts and perfect tailoring. Team them up with dhotis for a traditional and classy look. You can also experiment with different ways of draping the dhoti. Add mojris or kolhapuris to complete your look. He is noted for making exquisite wedding sherwanis, coats and anarkalis. Avoiding embellishments, he thrives on embroidery. Go for heavy fabrics, an unusual, edgy silhouette and rich colours to pull off this one. If you’re really going for something Rohit-Bal worthy, use peacock or lotus motifs inspired by Indian tradition. Using innovative prints, colour combinations and textures, his collections of sherwani for men spell out luxury. Choose brocades or suiting fabrics in English colours and a combination of indo-western silhouettes. Don’t forget to accessorize with heavy dupattas or neck-pieces. Specialising in occasion wear, he has been known to use inspirations from Russia to Persia with plenty of cultural touches. His garments are always royalty-worthy so use a lot of embellishments and bold colours. Using maximalist characteristics, go for appliques, zardozi embroidery and some all-over prints without shying away from colours for your very own Valaya. Abu Jani and Sandeep Khosla are all about swirling materials, elegant cuts and a blend of Indian as well as western silhouettes. Some of these are a little risqué but could work really well for a 70s-80s Bollywood-disco themed wedding. Incorporate sheer materials and delicate chikankari embroidery along with mirror work for a luxurious yet relaxed look. Anju Modi excels at pairing dhoti salwars and angarakhas with fitted jackets and modern silhouettes. You can go for anarkali style garments with western uppers complete with a shirt and tie as well. Use velvets, embroideries, silks along with lighter fabrics and maybe a dupatta to achieve this look. Using floral prints and languid silhouettes, this look is certainly different and edgy. Using waistcoats over flared kurtas, short jackets over straight, fitted kurtas, pastel colours, prints and layers will help you nail this look. Not only is it pleasing to the eye but also not as heavy and super comfortable. So dear Grooms, take the risk and do the unexpected. Ditch the predictable and go with a style statement that'll make you stand out. It's your wedding after all!